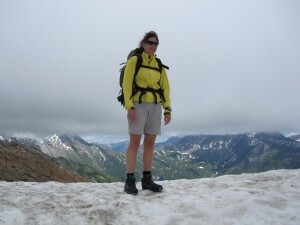 G and I hiked the Tour de Mont Blanc at the end of July, 2010. 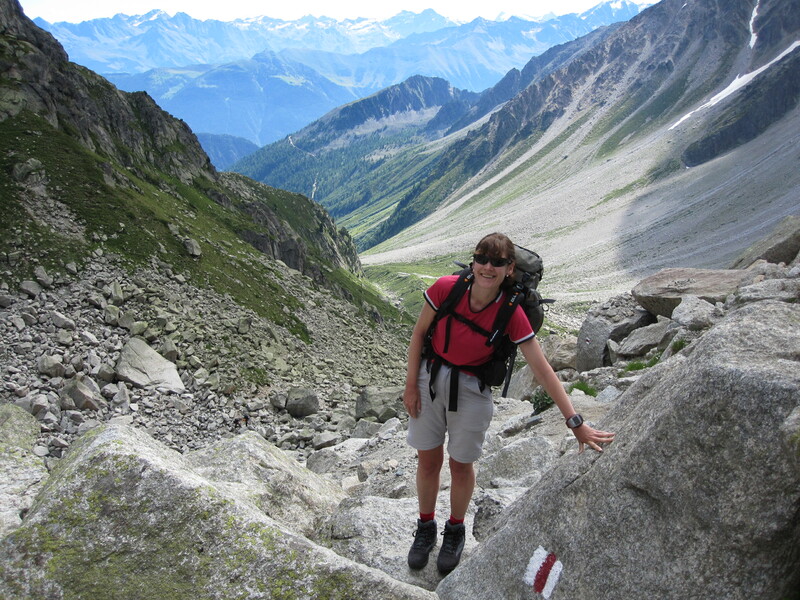 This is a well-known 100 mile (160km) hiking route through France, Italy and Switzerland. We did the tour anticlockwise in eight days, which included tackling the higher passes (Col Des Fours & Fenetre d’Arpette). That was pretty comfortable for us, arriving at our destination by mid afternoon on most days. There is an ultramarathon in which the winners apparently finish in about 20 hours, with a cut off of 46 hours; though this route is slightly different. The guide book suggests 11 days. Because the guide book is excellent, I’m not going to give you a day-by-day account of the walk. But it was beautiful – most days began in a valley, climbing up to a mountain pass in the morning, to descend to the next valley by mid afternoon. The essential guide is Tour of Mont Blanc by Kev Reynolds. This describes the route in both directions, describes the possible variants, suggests places to stay, and picks out key sights along the way. It includes a map of each stage, which is sufficient for most purposes. We also took with us the two IGN maps (3630OT and 3531ET) which cover all but about 500m of the route. Though not strictly necessary, we enjoyed spreading them over the breakfast table and planning our day able to see the bigger picture. You certainly don’t need a person to guide you. The route is very well signposted all the way round. There is plenty of accommodation – at mountain refuges, in bed and breakfasts and in good quality hotels. Some of the mountain refuges have only dormitories; some have a mixture of rooms and dormitories. Most provide a good, substantial evening meal. We did not book our accommodation in advance: we simply phoned ahead each morning. Even though we were there at high season, we had no difficulties finding rooms. We only came close to a problem on one day, arriving after a long day in La Fouly, where we had not booked ahead. We managed to get the last hotel room in the town’s two hotels; if we had not got that, we could have slept in the dormitory. In retrospect, I wish we had stayed in more of the mountain refuges. Apparently 25,000 people do the Tour de Mont Blanc each year, and you don’t need to be a marathon runner. Some people will want to take longer than 8 days; and some will do it faster. We saw lots of people quite a bit older than us out on the trails. There are a couple of long ascents (especially Fenetre d’Arpette) but these can be avoided by sticking to the main TMB route. Do we need to carry food and water? Although a lot of the walking is quite remote, there are mountain refuges every couple of hours where you can get a drink (in my case, a cappucino) and food. We each carried a water bottle, and a sports bar for emergencies. Obviously if you plan to camp, you may need to carry food and water. Thanks for the information! We depart US for Tour de Mont Blanc – self guided – on Sept 3. Start Las Houches, have the “bible” Cicerone publication. Looking forward to this, our honeymoon. Did your Kindle work on route? Yes, my Kindle worked en route. I switched off the 3G to save power; but it worked when I switched it on briefly in some towns. And what a splendid change from carrying a book. I read a couple of books on holiday which I simply would not have been able (or wanted) to carry. How did you call ahead to make the next day’s reservations? Did your cell phone work in the mountains and did you need to buy any special program? We only speak English–will that prove to be a problem in trying to make our own reservations? Owen replies: Yes, our cell phones worked wherever we tried them. (Though we left them switched off most days, both to avoid being disturbed and to be sure of having a full charge in case of emergency). I speak French, so I did the reservations in French. My guess is that English would have been OK, though. I notice that you didn’t carry a sleeping bag. Did all of the Refuges have douvets? I walked the GR5 this summer and carried a sleeping bag but only used it a few times. 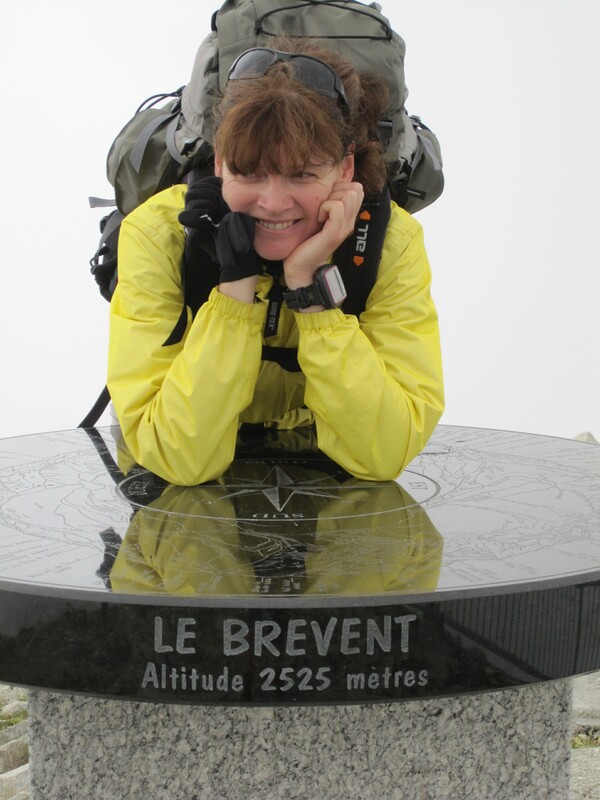 Some in the south of France only had blankets not douvets which is when I ended up using a sleeping bag for comfort. We carried a silk sleeping liner and used that with blankets in the refuges. I am planning a trip of my own in the Alps, more specifically along the same trail, and am debating whether to go privately or with an organized group. The agency had a set price of around 1800 Euros, b ut I was wondering about how much every refuge cost per night. Isabelle, my husband did TMB unguided, no need. Buy book by cicerone, it has it all, maps, refuges, hotels in villages. A must stay, Refugio Elano. Have fun! I did the TMB last Sept, anti-clockwise route. Great trek for my first time trekking in Alps. Arpette col a highlight, magnificent walk with great weather that day. Will do again and take in few alternate routes. GRTMB route map you have at top of web page is available for purchase / download?? Running in that terrain. Incredible but looks good for a hike. Sorry to drag you back to a long past trip, but we are heading off for an abbreviated TMB in mid July, many stages of which (indeed even chosen accommodation) match your itinerary. I am surprised by the distances you seem to have been able to cover. For instance, you say you did Courmayeur – La Fouly in one day. According to the Reynolds Guide that’s a 4.5h (to Bonatti) plus 6.5h = 11h day. 13km + 20km = 33km. We plan to take the skilifts down from Maison Vielle and save a chunk of time there. How did you manage to cover so much ground that day? Did you not find the Reynolds time estimates accurate? How much do you think fit but otherwise relatively inexperienced hikers should discount your benchmarks? Yes, the fourth day from Courmayer to La Fouly was a long day (but there wasn’t an obvious way to shorten it without making it too short). The day into Courmayeur was fine – we were there in plenty of time (and we walked down, rather than taking the ski lift). 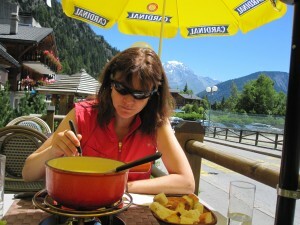 Courmayeur is lovely so do try to get there with time to enjoy it. One more thing: I’d really recommend bringing at least one walking pole per person- the downhills can be tough. Your knees will thank you! We are going to do the TMB and wondered if the refuges had vegetarian food available or is it mostly meat entrees for dinner? Your post has been a great help. If I may ask a questions. Would I need some type of permit or referrer anywhere before I start. Or do I just book my hotel and Gîtes and just go? You don’t need any kind of permit. My husband and I want to do TMB this year in july. We would love to walk the whole way but we have only 7 days to do it. But to do that we might have to walk for 15-16 miles per day. Out fitness level is normal and we will train for it. But did you meet anyone who did the hike in 7 days? Is it possible or will it be too strenuous? Will we be restricted by the location of the huts? Soumya, I don’t mean to steal Owen’s thunder here bbut my wife and i did an abbreviated TMB 2.years ago and i worked hard at planning it. Ill add our itinerary and thoughts here later. But email me directly if you want for mire info. With Owen’s permission (pending), here is a link to my brief notes on how we (normal people, not trained marathoners) did about 75% of the TMB (and I think the best segments) in just 7 days/6 nights, including specifics on the key ShortCuts available. Thanks a lot for the link Peter. Your link really helps me. I will email you if I am any more questions. I bought the Key Reynolds book which is also helping me plan. Thanks to Owen and Peter! Like Soumya, my husband and I will be attempted an abbreviated TMB in 7 days (with the additional consideration of jet lag!). Thanks for the itineraries. Very helpful for planning. 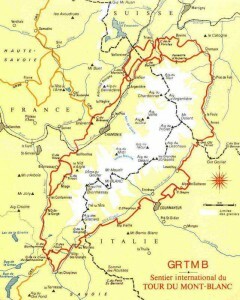 Hello I am going to do the tour of Mont Blanc and wondering what the best time to go is. Is September slower traffic? Also it seems that there are so many variations of hiking this trek it almost seems silly to try and make reservations at refuges in advance is this accurate? Also is there a way to find out which refuges are more accomidating then others to try and make those the ones you stay at? Is it worth planning on staying a night in chamonix? Or just pushing through to les houche and starting your trip? I have ample time and want to make sure I get to see and do the best of all this joke has to offer. Any tips would be greatly appreciated. Thanks!